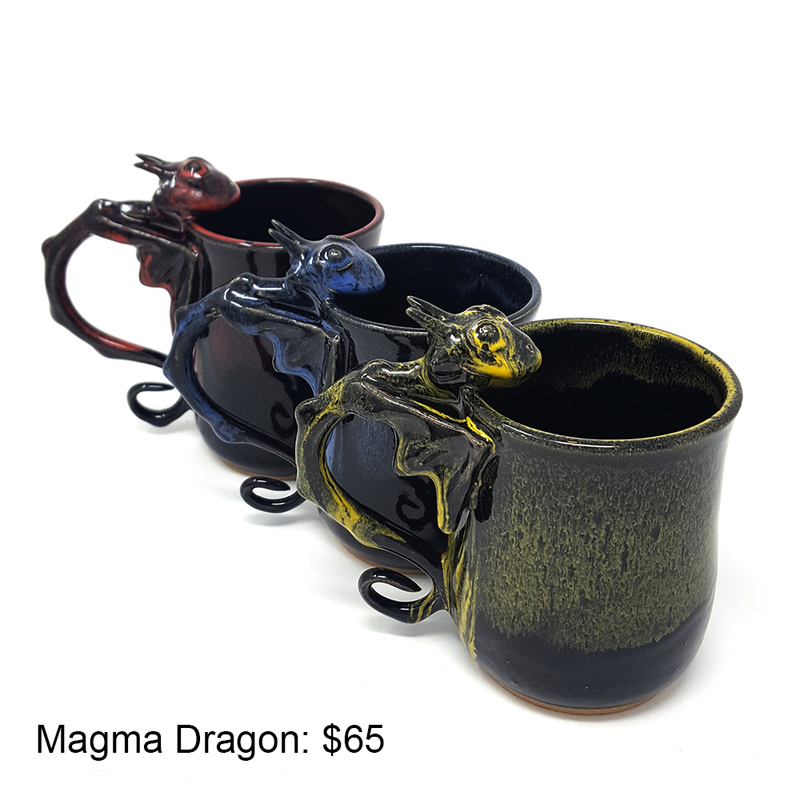 These 4 dragon mugs will be available for pre-order on Instagram on Monday, August 30th at 8PM EST. I'm so excited to finally be able to offer Dragon Mug Pre-Orders again! Here I will outline how pre-orders work so that you can be ready when they are released. Please Note: For handmade artists, the holidays are closer than they seem. I hope to have at least one dragon mug pre-order a month, which really means only 5 chances to get a custom dragon mug as a holiday gift. Each pre-order will likely have 3-8 mugs, so please plan ahead - you can't last-minute shop for custom gifts! 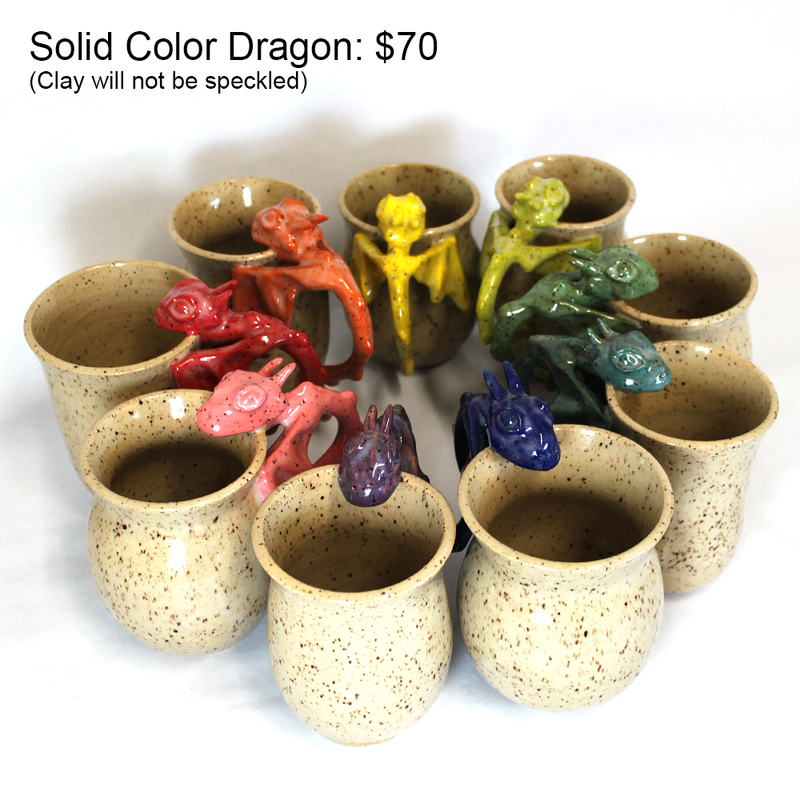 Pre-orders are blank dragon mugs ready to be glazed with the colors of your choice. 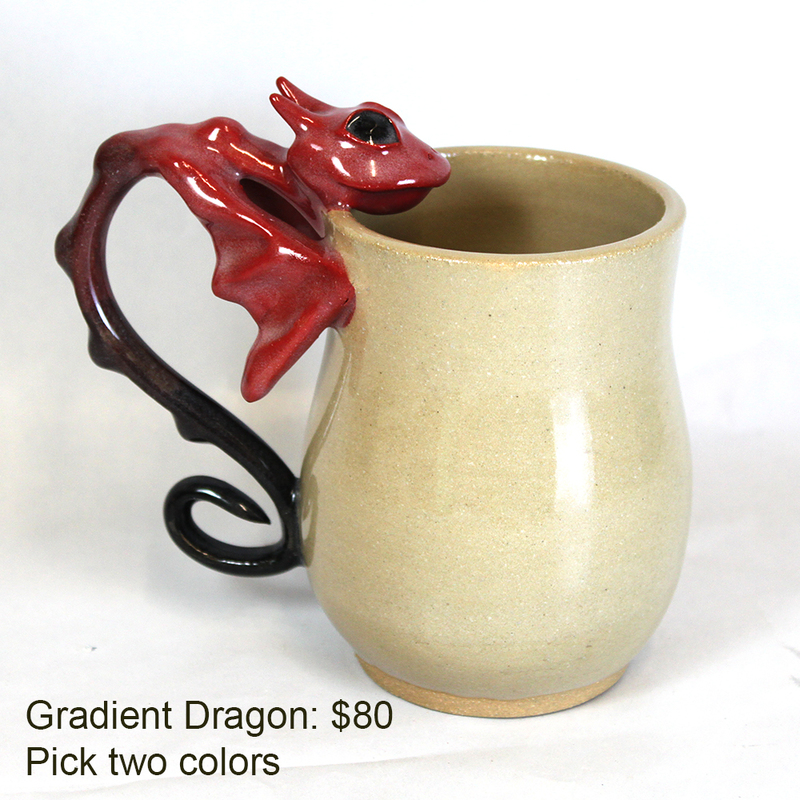 This lets you pick out the dragon you like best and allows you to choose custom colors for your mugs. Several color variations and price options are available (shipping is additional.) Since the mugs have yet to be fired, I cannot give exact ounce measurements, but most of my mugs are between 14 - 20 ounces. Each pre-order will state the expected time it will take for the mugs to go through their two firings and be ready to ship. How do I get a pre-order dragon mug? Pre-orders are released via an Instagram post. Once the post is live, you must comment "SOLD" and the number of the dragon mug you want to claim your pre-order slot. I will then contact you for your shipping information and color choices. Following our conversation, you will receive an invoice in your email which you can pay with a credit card through the secure Square processing service. What are the color choices? Drippy style mugs featuring a black base and a secondary color. Please note: some bleeding between colors is possible. Features custom-mixed underglaze and a natural mug color under clear glaze. May choose an additional eye color (black is a popular choice.) Since colors are custom-mixed, they may vary slightly, but there are a lot of options. Color Choices: White, grey, black, red, pink, yellow, orange, yellow-green, olive green, baby blue, sky blue, navy blue, blue-green, turquoise, light purple, dark purple, and more! Features two custom-mixed underglaze colors on a natural mug under clear glaze. May choose an additional eye color (the tail color is a popular option.) Please specify which color you would like at the head and which at the tail. Since colors are custom-mixed, they may vary slightly, but there are a lot of options. Feel free to ask below, or email me at stephanie@firedfigments.com.